Buckle up for the kick-off to arguably the most significant season in Tottenham�s history since a bunch of school kids started the club under a lamp-post in 1882. Bobby Buckle and his mates could not have imagined just what they were launching as they carried their home-made goal posts to the Tottenham Marshes for their early matches. Without Bobby and the boys there would be no Spurs, and we would not be about to celebrate a move to a wondrous, new state-of-the-art stadium that takes away the breath of everybody who sees it for the first time. 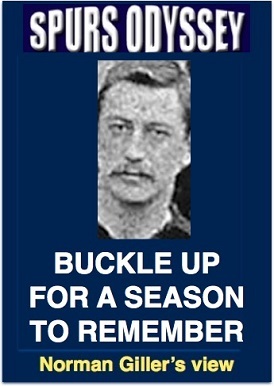 Some Tottenham fans out there need a history lesson to help make them wake up to just what is happening. They were either not around or have short memories if they cannot recall how the club was a bank manager�s telephone call away from going under in the 1990s. Right through this close season I have read moaning and groaning about the lack of activity in the transfer window, with Daniel Levy taking appalling stick from myopic supporters. People who could not organise the building of a garden shed have given Levy a good kicking on the social network. I just hope they bow the knee to him when they take their places in the astonishing new home and realise just what he has achieved. As I write there are stories of Toby Alderweireld going to Manchester United and Jack Grealish possibly coming from Aston Villa to Tottenham. Whatever the truth, take it for certain that Mauricio Pochettino knows what he wants. Leave him to manage and get behind the team, not in its way. Those demanding that Spurs make a symbolic signing to mark the opening of the stadium do not seem to understand that the STADIUM is that meaningful signing. It is the club�s �850m statement that Spurs are determined to be one of the biggest clubs in the world, not just the Premier League. I don�t imagine for one minute the critics will love Levy, but just try leaving him alone. Put yourself in the boots of Bobby Buckle and the boys and realise the miracle that is happening before your eyes. You have a dream stadium and will be watching a dream team. Enjoy! When Tottenham try to take goals to Newcastle on Saturday, I hope the Geordies make a little bit of a fuss of World Cup winning captain Hugo Lloris and World Cup golden boot winner Harry Kane. Spurs are planning a special ceremony at their first 'home' game against Fulham at Wembley on Saturday week, recognising the NINE Tottenham players who appeared in the semi-finals: of course, Hugo and Harry, plus Danny Rose, Eric Dier, Dele Alli, English player of the tournament Kieran Trippier, and Belgians Jan Vertonghen, Mousa Dembele and (if still with Spurs) Toby Alderweireld. Colombia's rapidly improving Davison Sanchez, South Korean hero Son Heung-min and Christian Eriksen, Denmark's inspiring schemer, will not be left out of the Tottenham Pride Parade. They have all imbued the Bobby Buckle Spurs spirit. THERE was no hint as the 1963-64 season dawned that it was to see the break-up of the �Super Spurs.� The heart was ripped out of the Tottenham team in a tragic and painful way as White Hart Lane was reduced to a morgue of misery. For Danny it was the end of the football playing road. The nightmare was slow and drawn out. It started on the evening of 10 December 1963 at Old Trafford, when Tottenham were playing Manchester United in the second-leg of a European Cup Winners� Cup tie. Dave Mackay broke a leg in a collision with Noel Cantwell that surely left the United skipper losing sleep about the validity of his challenge. For ever after Dave referred to the Irishman as �Cant�, making it sound as close to an obscenity as possible. "I feel no sadness, more relief that I have taken the difficult decision to hang up my boots. As Edith Piaf sings, �Je ne regrette rien .� I�ve been weighing everything up since Bill dropped me. He did not say anything to me. He did not have to. There was a silent understanding that this was it, the final act. I dwelt on it for a few weeks, and then reached my decision. My spirit was willing but the flesh was weak. The body was saying loud and clear that it was time to climb off the merry-go-round. Now it is time for the rest of my life. In a matter of weeks, Spurs had been robbed of the brains of the team and the heart of the team, and worse was to follow at the end of the season. John White, the eyes of the team, was sitting under a tree sheltering from a storm on a North London golf course when he was tragically killed by a freak flash of lightning. Tottenham had lost the three most vital cogs in their machine, and Danny � after a brief spell of coaching at the club�s Cheshunt training ground � looked on from his new perch as Sunday Express columnist, while Bill Nicholson started the team rebuilding challenge. He was determined to recreate the startling success of the previous three years. To replace John White he bought Terry Venables from Chelsea, and as successor to Danny he turned to Fulham and future England midfielder Alan Mullery. It took months for the demanding Tottenham fans to accept the new players. Danny and I arrived at Express Newspapers at the same time, me from the Daily Herald (which morphed into the broadsheet Sun before becoming Rupert Murdoch�s tabloid toy) and Danny from the Tottenham training ground. I was working flat out six days a week on the Daily Express (circulation 4.2m a day back then), while Danny had found himself a cushy corner on the Sunday Express that allowed him plenty of leisure time for his first love of golf. I often used to tease him that he was a lazy so-and-so, and tried to encourage him to follow up his superb autobiography of 1961 (The Double and Before ) with more books, but he was having too enjoyable a time playing his golf and driving his fast cars, usually a Jaguar or a high-powered Mercedes. I remember the first car in which he gave me a lift in his playing days was a sleek Sunbeam Rapier with a personalised BLF number plate. For somebody who liked his privacy he did not mind drawing attention to himself. Danny � Dapper Danny � always dressed immaculately, never in the 70s style of flared trousers and kipper ties but more like a � dare I say it � an English gentleman, with a distinct cut of Savile Row about him and favouring a neat hair cut that was more James Bond than Beatles. He prided himself on tying the best Windsor knot in the Tottenham dressing-room in an era before open-neck shirts were the fashion. He was a true visionary, and all those years ago he was shouting for a European champions league rather than the knockout tournament it was in those days, and he was always calling for a United Kingdom team rather than the four home countries. 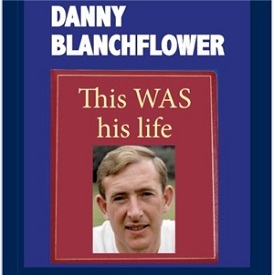 Danny was the leading critic of Alf Ramsey as he prepared England for the 1966 World Cup finals. He had arrived at the Lane just before Alf left to start a career as a football manager with Ipswich Town. Over the following years they grew to detest each other, mainly because Danny never hid his distaste for what he saw as the negativity and over-physicality of Ramsey teams. Danny�s famous quote about the game not being about winning but the glory was like foreign language to Ramsey, to whom winning was everything. It was difficult to believe that they had both come out of the same Tottenham school of sophisticated football. When Alf decided he could play without wingers, Danny � always a fan of playing the full width of the pitch � was struck almost speechless, a near-miracle in itself. The tackle on Jacques Simon reduced the French star to a passenger�s role, and Fifa wanted Stiles dropped from the England team. Alf stood by him and told the FA that if he was out then he would be out, too. �In intention and delivery, England were as defensive and negative as any team in the tournament. At times they looked less so because they were urged on by the Wembley crowd. The defence was given too much credit and talked of as the best in the world. In fact, the forwards, written off in the early stages, were selected more as initial defenders than attackers. In the end it was Hurst and Ball who did most to win the Final. Persistence and stamina were the qualities that carried the team through. England endured, but there was none of the shining skill that we had seen in previous World Cup finals. After I had tunnelled my way out of the Daily Express in 1974 to become a full-time author (pretentious, moi? ), I wrote TV sports columns for the London Evening News, Sunday Express and The Sun, ghosting books and newspaper columns for my best mate Greavsie. We were as mystified as everybody else as to why Danny was seeming to be frozen out by BBC and ITV. He had served a long apprenticeship as a regular contributor to Midlands TV shows when at Aston Villa, and later on Yorkshire Television, but he never made it as an established contributor to national television. I tried to get him on board with a TV series I devised called Who�s the Greatest , but it was made clear to me that he would not be welcome by my ITV paymasters. "I would love to have Danny in our team if I thought I could control him, but he can be so cantankerous and bloody minded, one minute charming you and the next making you boil because of straight-for-the-jugular comments. When he retired from football he seemed a natural for the box, sharp of mind, wittier than most comedians and a past master of football. He did so much to help make it the Beautiful Game. But then there was the other Danny, the man who would make outrageous statements and talk over other people on the screen. For such an intelligent man, he had one major flaw: he did not know when to shut up. We just dared not give him a regular spot on our flagship football shows." "Danny was a born story teller, but lacked the necessary discipline to be a team player. You must be able to follow direction, and know the importance of when to talk but, just as important, when to keep quiet. Silence can be golden when you are at the mic. Who was a youth footballer for Spurs, played in Sweden, later returned to Tottenham, scored 22 goals in 44 international matches and holds the record for most headed goals in the Premier League? Please email your answer to me at Teaser15@normangillerbooks.com. Deadline: midnight this Friday. No prize, just pride and the satisfaction of being right! Last week I asked: Who was a League Cup winner with Spurs, had a rewarding partnership with Jurgen Klinsmann, became an MBE and during his career scored 189 Premier League goals? A lot of you dived in and said Teddy Sheringham, but the player I was looking for was �Sir Les� Ferdinand, who managed to remain dignified and gracious while battling in the cauldron of the penalty area. A great player, a good man.